Those who have read my site since the beginning know that I have written much in terms of Naval History. One of the things that I am drawn to are the great ships that were sacrificed with the crews in futile attempts of salvage victory from defeat, or which were sacrificed in order to save others. Regardless of the circumstance I have a soft spot in my heart for sailors of any nation who pay with their lives when their ships are sunk. 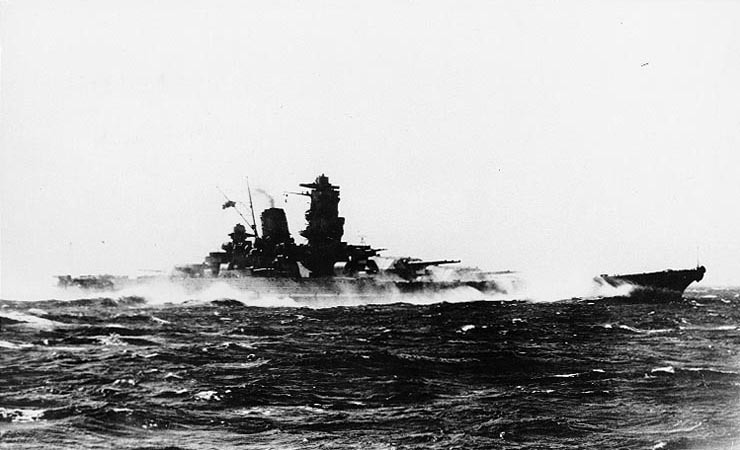 This is the story of the IJN Yamato, who along with her sister ship, the Musashi were the largest battleship ever constructed. The great battleship Yamato and her sister ship Musashi were the largest warships ever built until the advent of the USS Enterprise CVN-65. Displacing over 72,000 tons 863 feet long and 127 feet in beam these ships mounted the largest artillery battery ever placed on a warship. Their nine 18.1” guns mounted in three triple turrets each weighing over 2500 tons weighed as much or more than the largest destroyers of the time. They could fire their massive shells 26 miles and had the capability of firing a special anti-aircraft shell known as the Sanshiki or beehive round. However when the American attacked Okinawa on April 1st the Navy launched Operation Ten-Go. In spite of overwhelming American superiority in both naval air and surface forces the tiny task force was to fight its way to Okinawa, beach their ships and once the ships were destroyed the crews were to join Japanese Army forces on the island. The doomed sortie was in part due to the insistence of the Imperial Army which derided the Imperial Navy for its failures at Philippine Sea and Leyte Gulf and pressure from Emperor Hirohito who asked “But what about the Navy? What are they doing to assist in defending Okinawa? Have we no more ships?” In response the Naval High command devised what amounted to a suicide mission for Yamato and her escorts. The plan was opposed by many in the Navy and leaders of the task force who saw it as a futile mission. Only the insistence of Admiral Kusaka who told the reticent commanders that the Emperor expected the Navy to make its best effort to defend Okinawa persuaded the Captains of the doomed force to accept the mission. By 1405 the great ship was dead in the water and just minutes before her commander had ordered the crew to abandon ship. 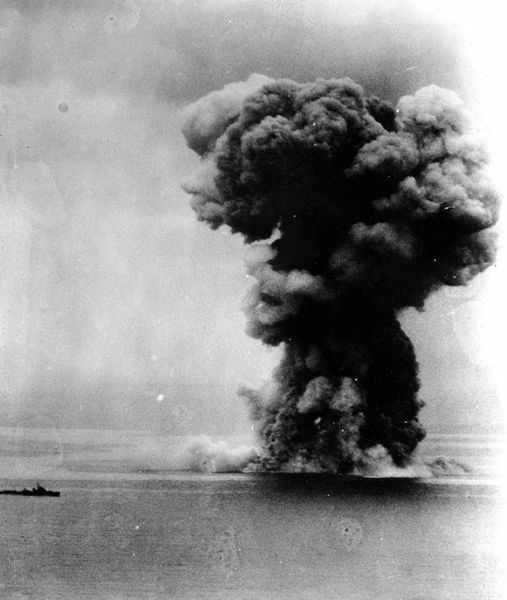 At 1420 she capsized and began to sink and at 1423 she blew apart in a massive explosion that was reportedly heard and seen 120 miles away and created a mushroom cloud that reached 20,000 feet. Only 280 men of the estimated 3000 crew members were rescued by the surviving escorts. 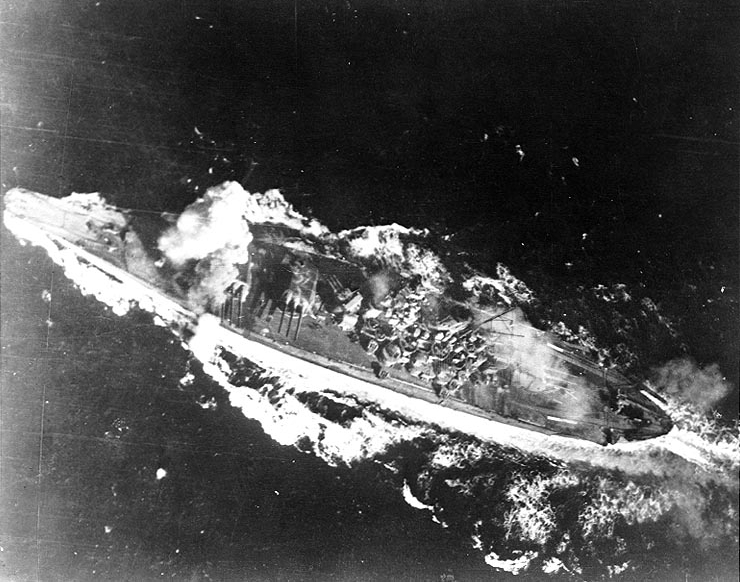 Of her escorts, the Yahagi and four destroyers were also sunk. The Americans lost a total of ten aircraft and 12 men. Never again would the surface forces of the Imperial Navy threaten U.S. forces or take any meaningful part in the war. I cannot help but think of gallantry of the doomed crews of these ships, sacrificed for the “honor” of leaders that did not really value their sacrifice. It is a commentary that is timeless.